Gary Hill. The Psychedelic Gedankenexperiment. 2011. 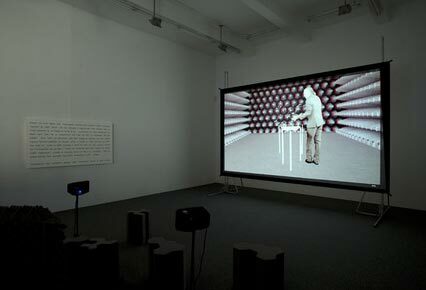 Two projection screens, two HD video projectors, eight specially fabricated foam chairs, four text panels (each 40 x 71 inches), four amplified speakers on tripods, 3D glasses, acoustic foam/plywood divider, one computer with two channels of Quicktime pla Courtesy the artist and Gladstone Gallery, New York and Brussels. Saturday, March 31st, 2012 from 2:00pm to 3:30pm at Henry Auditorium. $5 for Henry members and UW students; $10 General Admission. Tomorrow, at Henry Art Museum in Seattle, Gary Hill and George Quasha get scientifically psychedelic with performance art involving digital media and live video manipulations, human bodies, languages and rhythms, and everyday materials. In their collaboration, the two use what is probably overly wordy terminology (‘electronic linguistics”, “psychotropic languages vehicles”, “dynamical lingualia”, and “lingualities”) to achieve the final goal: “a pulsational conversation with stepped-up intensity in which Real Time is invited to show its other side.” Indeed, Real Time is purposely capitalized with an R and a T, and if Hill and Quasha are as brainy and far-out as their lexicon would lead one to believe, glossodelia will be a brainy mindfuck of a performance. Those unable to make the performance still have the opportunity to view the installation glossodelic attractors, on display at the Stroum Gallery from March 31st through September 16th. Preview images below, with descriptions lifted from the Henry Art Museum’s website. Gary Hill. 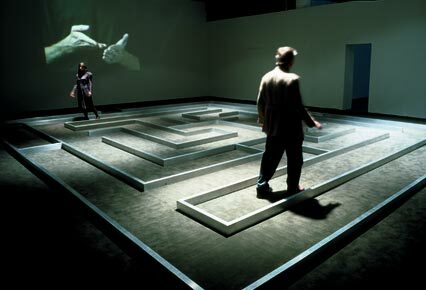 Withershins [installation view at Institute of Contemporary Art, Philadelphia, Pennsylvania, 1996]. 1995. Floor maze constructed from 2-inch x 4-inch (5 x 10 cm.) aluminum rectangular tubing, pressure-sensitive switch mats, two video projectors, four speakers, carpet, two computers with multi-channel interface and sound cards and controlling software written Courtesy the artist and Donald Young Gallery, Chicago. Photo: Gary McKinnis. Gary Hill. Beauty Is in the Eye. 2011. 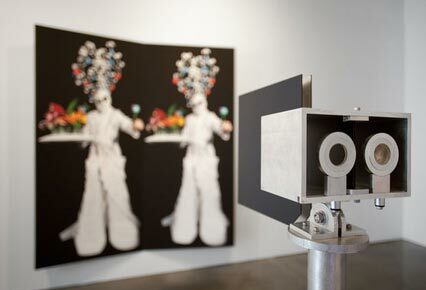 HD LCD monitor, two amplified speakers, two giclee prints (combined dimensions of 95 x 84 1/2 x 8 inches), stereo viewer (aluminum and wedge prisms), and media player (color; stereo sound). Courtesy the artist Gladstone Gallery, New York and Brussels. Gary Hill. 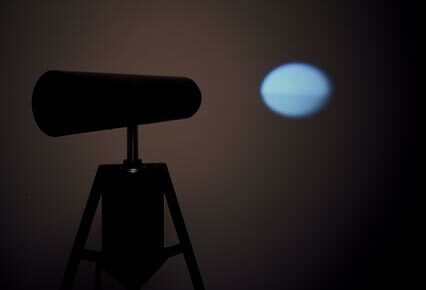 Searchlight [installation view at Kunstmuseum Wolfsburg, Wolfsburg, Germany, 1996-1997]. 1986-1994. Stainless steel tube containing 3-inch black-and-white video monitor (cathode ray tube removed from chassis) and projection lens mounted to steel tripod base with DC motor, one small pin spotlight, three speakers, two-channel synchronizer, two laserdisc p Courtesy the artist. Photo: Helge Mundt. Gary Hill. 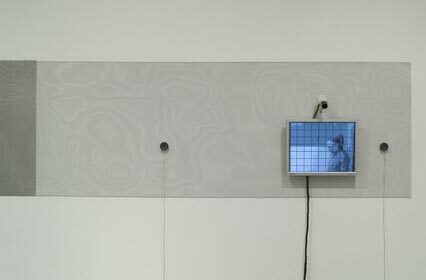 Mesh [installation view at Donald Young Gallery, Chicago, 2006]. 1978-1979. Three closed-circuit cameras, four 21-inch LCD monitors, sixteen 3-inch speakers with amplification, computer with Max/MSP/Jitter software, sensors (switch mats), firewire audio interface, wire mesh of varying gauges, and speaker cable. Courtesy the artist. Photo: Tom Van Eynde.